Site Popularity - Site popularity is a measure of the interest that users have in finding or using a web page. Search engines use site popularity (such as amount of traffic) as a factor in determining the relative ranking of web page URLs that are presented as the result of a keyword search. Link Relevance - Link relevance is the relationship of content on a web page that a link refers to as compared to the content of the web page it is linked from. Link value is a measure of relevance or search context contribution that a web page link provides to the web page that it is linked to. Metadata - Web site metadata is information that describes the contents or focus of the web page that is created by the web site developer. Search engines may use metadata to categorize the web site. Some of the metadata (such as the title) may be displayed in the search results window. Keywords - Keywords are words that relate to an item, service, or other form of information. Some of the ways that keywords influence SEO is keyword density, keyword positioning, keyword emphasis, and the use of brand keywords. Inbound Link Popularity - Link popularity is a measure of the interest that users have in finding a link (URL). 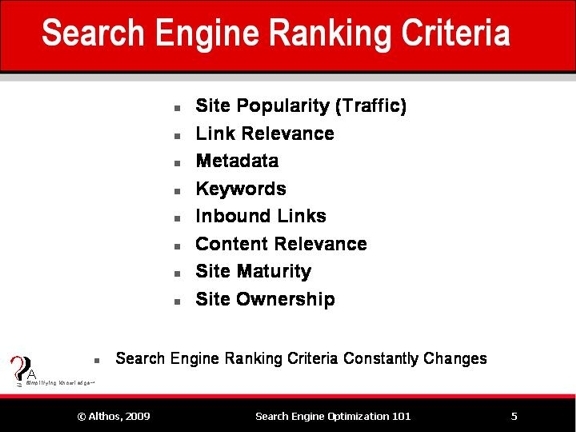 Search engines use link popularity as a factor in determining the relative ranking of web page URLs that are presented as the result of a keyword search. It is important to get inbound links from popular web sites that have content that is similar or related to the web page. Content Relevance - Content relevance is a measure of how the contents of a document or web page relates to a category or interest of a content user as expressed in a search query. Some of the metrics that factor into content relevance include amount of content, site interactivity, and the presence of other semantically relevant words. Site Language - Site language is available text language or languages for the web site. Web sites that contain text in other languages may be given preference or higher ranking for people who search in the countries that use that language. Site Maturity - Site maturity is length of time that a web site has been operational or registered to an owner. Site maturity may be characterized by domain origination and expiration date. Site Ownership - Site ownership refers to the person or company which is the authorized entity that can control or decide how the site may be used. Multiple web sites that are identified as having different owner names may be identified as the same owner through the use of host site IP addresses, technical contacts, or the use of the same credit card to register or host the domain name. Syntax Correctness - Syntax is the relationships among characters or groups of characters, independent of their meanings or the manner of their interpretation and use.